Description: Gray squirrels are four-legged, with an 8" to 10" long body and a bushy tail typically just as long as the body. They are usually gray or brownish in color (colors will be extremely varied from location to location). These animals are excellent climbers. They are the most intrusive and territorial nuisance wildlife. We service more squirrel eradications than any other simply due to that fact. Squirrels will continue to inhabit a given area or structure until they are forced to re-locate. Typically, squirrels are in families of 2 or more, but they are more than capable of surviving solely. Squirrels do not hibernate and are typically active throughout the daytime hours. Squirrels often use a number of gestures and "barks" or vocalizations to converse with one another, much like mice or rats. Watch a Squirrel Being Trapped! Food Sources: Gray squirrels can make use of a wide range of foods including, but not limited to: a variety of nut (especially acorns), berries, fruits, bird and livestock feed, and even tree bark. When food is scarce, squirrels will resort to eating frogs, insects, and other small rodents out of necessity. Food for these types of creatures is more abundant in the spring and summer months when vegetation is at it's peak. Squirrels are known for "scatter-hoarding". They will hide a variety of food sources in a number of specified places for safe keeping. Squirrels have been known to have as many as 1,000 scattered hoards of food per season. They have a very systematic order for scattering these food sources. Some of the scattered food supply will be retrieved quickly (in a few hours or days), while others may be stored for months at a time. Squirrels are considered food sources for the following predators: hawks, humans, owls, feral cats, dogs, snakes, and raccoons. Life Span & Reproduction:Squirrels have fairly definitive breeding seasons. The first season of breeding occurs between February and April, and the second season occurs in August or September. 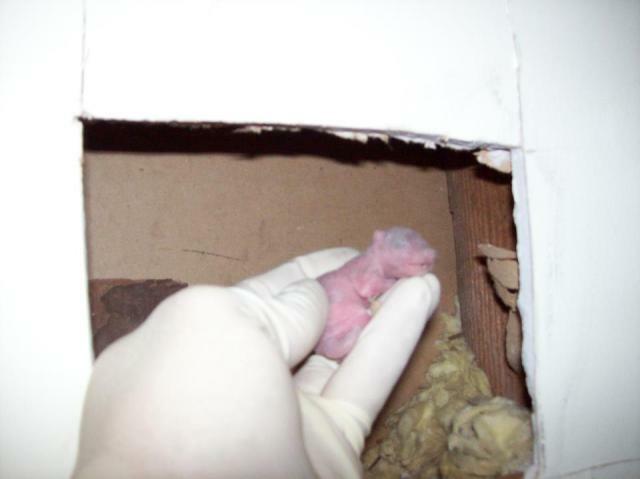 Normally, a female squirrel will give birth to a litter of approximately 2 to 6 young, but as many as 8 can be born in one litter with a gestation period of 45 days. Mother squirrels insist on chasing away the male and raising the young alone. After a period of about 6 weeks or so, the mother will wean the young. After 10 weeks or more, the young will leave the nest to venture out on their own. These young can begin breeding at as little as five months of age. Grey squirrels are known for building nests & dens to facilitate breeding and for warmth in the colder months. They can live up to 12 + years in the wild. Typical Areas of Entry: Because of the squirrel's territorial nature, an opening does not have to pre-exist for the squirrel to gain entry. They are perfectly content chewing an entry hole into any structure simply because they want to gain entry for warmth and shelter. A large number of squirrel invasions occur during breeding season because female squirrels are searching for a nest to birth and grow their young. Squirrels are partial to entering, but are not limited to entry through: open chimney flues, open rooflines, unscreened gable vents, crawlspace vents, roof vents, bath vents, kitchen vents, dryer exhaust vents, rotten fascia or soffits, rotten wood within the roofline, and a number of other potentially open areas of the exterior of a structure. Pertaining to chimneys: Starting a fire won't help - you will simply allow the damper to become open, allowing the squirrels easy access inside and in to the living space. Squirrels will be urinating and defecating in the areas they habituate. Insulation, existing in the attic or crawlspace, will become soiled and an odor is likely to be profound due to the excrement, as well as debris left behind. The "R" value, which dictates thermal resistance, will become declined over time as the squirrels push down the insulation little by little. Their continuous running, even without debris left behind, can destroy and make insulation useless. Trappro offers attic insulation/debris removal along with re-insulation services. Typical Treatment: First, a thorough inspection of the structures exterior and roofline by a Trappro technician will be completed. Any area(s) of entry will be identified and the option will be presented to begin trapping and removal services. Trapping services last for approximately 3 to 5 business days and work as our first line of defense. Live cage traps will be set near or on the entry/access points. The open areas where the squirrel(s) have gained entry will be monitored for activity during the duration of the trapping service. The technician will be placing a breakable barrier of some sort over/inside the holes or entry points to monitor the squirrel(s) movements in and out of the open areas. This technique allows us to record wildlife activity and will assist in dictating the duration of the trapping service needed. Once a point of no activity has been reached, Trappro will feel comfortable removing the live traps and installing temporary screenings over the existing entry points. The trapping/removal service, along with our patch, is guaranteed against animal re-entry for a period of 30 days. Trappro recommends permanently sealing the squirrel(s) area(s) of entry. Upon the inspection, a proposal will be provided for permanent repairs to the home or structure. Trappro completes and warranties permanent repairs against wildlife re-entry for up to 10 years. Trapping and exclusion of squirrels is available for home and business owners and business owners throughout Maryland, Washington DC, and Northern Virginia through Trappro. Dangers: The largest danger with squirrels is their chewing abilities. Not only will chewing allow them entry in to the home, but squirrels prefer to chew on electric and utility wires (fire hazard), drywall, wood, and all other types of materials. Squirrels will chew on drywall for calcium deposits. Although this may appear that they are attempting to gain entry, once they reach light, they will move on to another area. Squirrels also carry ectoparasites (fleas, ticks, bed bugs, lice) that are easily transferred to other surfaces, pets, and humans. During Squirrel Season: Squirrels love to enter attics and sheds, chewing holes and causing damage to many areas of the roofline *We safely remove Squirrels, clean up the mess & can provide repairs to prevent animals from reentering. Have your squirrel intrusion on the road to resolution! Our professional trappers will also be able to seal up holes in attic or walls including fireplaces and vents where squirrels have entered the home. Trapping and exclusion of squirrels is available for homeowners and business owners throughout Maryland, Washington DC and Northern Virginia. Trappro squirrel trappers are experts in trapping squirrels that have gained access to your attic, walls, roofs, chimneys of house, shed or other areas of your home. Squirrels will be trapped and removed. Squirrel nests, droppings and other messes made by squirrels will be safely removed from walls, attics, sheds etc. Dead squirrels or baby squirrels will also be carefully removed if found in your home in Maryland, Washington DC or Northern Virginia. If you hear strange sounds in the walls, floors or attic of your house call us today.